Q. Don’t you think surrender is the best way, as it is the essence of the 4 yogas? Tom: It depends. It’s true that surrender is essential for most, and it becomes more prevalent, especially as spiritually matures. Surrender is a wonderful way. But surrender itself ends in stillness of mind. 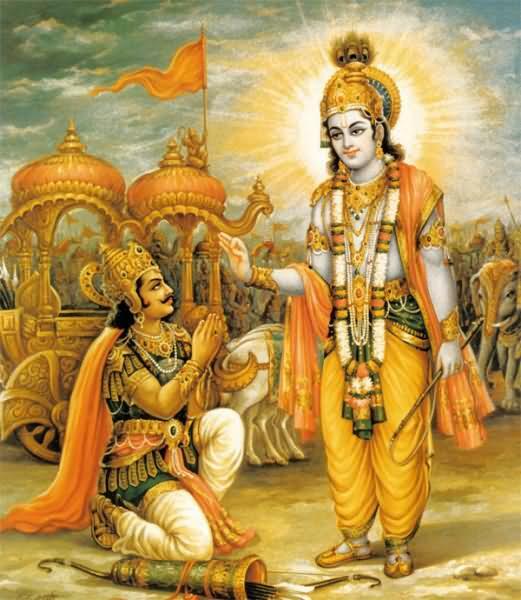 However some cannot surrender, and need to do karma yoga first. Others need to do hatha yoga and meditation. Others are more intellectually inclined and do viveka, or discrimination between the changing and unchanging, as per Jnana yoga. The best yoga is the one you actually do. Q. How to practice the 4 yogas? Q. Don’t all the yogas go together? It’s not like you can either chose Bhakti (devotion) or Karma (action) yoga, but you practice them both together. Is that correct? Tom: Well for some it starts with a single yoga, for example bhakti yoga, and then as bhakti yoga progresses, all the yogas end up coming together. This is the same for all the yogas. Usually people start off with an affinity for one of the yogas, be it, raja yoga (meditation), bhakti yoga, karma yoga or jnana (knowledge) yoga. As the yoga progresses, the body-mind becomes purer, more integrated, and naturally develops an affinity for one of more of the other yogas. Eventually all the yogas come together, merging in stillness of mind (samadhi). The ultimate yoga is for the ego to simply be still, dormant, and in that dormancy, through the ‘grace of God’, it can collapse, at least that’s how it appears. It can be seen there is no ego, there is no doer/author of actions. You see, in reality all of this is false. There never was any ignorance. There is no ignorance. Ignorance is of the ego. Ignorance is the ego. Ignorance, yoga and liberation are all the ego’s projections, and the ego itself is a fiction. Who is searching, and for what? Does Karma really exist? I know that you can say, “No it doesn’t.” But as long as you believe that you are a body and mind, as long as you feel the world to be real, you cannot fool yourself. Do not lie to yourself. If the world perturbs you, if people bother you, if things annoy you, if you are reacting to conditions this means that you believe you are a body going through these experiences. And as long as you are going through experiences you are in karma. You are experiencing the karma that put you here as a body. It is only when you have realized the self that there is no karma. Therefore do not go around telling people that there is no karma, it will give them license to do anything they like. Feeling there is no retribution, there is no effect for their deeds. This is not true as long as you believe you are a body. For there are laws of the universe that respond to your actions. Karma means action. And as long as you believe you are the actor you will have to experience the results of the karma. So in this particular life you are experiencing the results of not only the karma of this experience but of previous lives. Previous lives also come into effect whenever you believe you are the body. There are only two ways to destroy the karma. And the other way is to surrender completely to God. Totally surrender your life to God. God is within you as you. You therefore surrender everything to the self. Thy will be done. You begin to see that as long as you have God to surrender to, you need not worry, you need not fear. Everything will be alright. The point I’m trying to make is that the Sages understood that at this age the way to realization, the way to unfoldment, the way to liberation, the easiest way is through namah japa, the chanting of God’s name. This they say was the thing to do in this age. This is the meditation to do in this age. Namah japa, chanting of God’s name. As an example, “Sri Ram, Jai Ram, Jai Jai Ram.” This is what human beings were supposed to do in this age to awaken. As the years went by people such as Buddha, Shankara, Jesus, some others, people that we know about like Sri Ramana Maharshi, Nisargadatta Maharaj and others including myself came to conclusion that what is needed in this age is a combination of teachings. Jnana Marga, the path of wisdom is the highest stage of all yogas. That combined with Bhakti Marga, the path of devotion and Karma Marga, the path of service. These are the stages, these are the principles that we have to learn and understand. Therefore what I do is teach those three methods together, combined. When you teach Jnana Marga by itself as many so-called beings, gurus are doing today it becomes a bunch of rhetoric. It builds up the ego, it doesn’t destroy it. Jnana Marga by itself becomes cold and calculating. People start to feel as if they are superior to others. It is called also the talking school. Where people talk to each other debate issues about Jnana Marga. Get involved in heated discussions, debates, arguments and you get absolutely nowhere. It is called also the talking school. Where people talk to each other debate issues about Jnana Marga. Get involved in heated discussions, debates, arguments and you get absolutely nowhere. If you teach and you learn Bhakti Marga, the path of devotion by itself you can become a fool. Where you become devoted to all the statues and all the trees and become devoted to all the gurus and you have just blind devotion, without knowledge. So that is not sufficient. When you practice Karma Bhakta, the path of service to humanity. You become the servant of other bodies. The servant of the people. Yet you become confused because you don’t really know who to help. You really don’t know to whom to give service to. There are so many poor people, homeless people, deprived people, whom shall you serve? And again you become confused. But when you combine all of them together, Jnana Marga, Bhakti Marga and Karma Marga you have a beautiful teaching. Know well that even performing tapas (spiritual practice) and yoga with the intention ‘I should become an instrument in the hands of the Lord Siva’ is a blemish to complete self-surrender, which is the highest form of being in His service. Since even the thought ‘I am an instrument in the Lord’s hand’ is a means by which the ego retains its individuality, it is directly opposed to the spirit of complete self-surrender, the ‘I’-lessness. Are there not many good-natured people who engage themselves in prayers, worship, yoga and such virtuous acts with the aim of achieving power from God and doing good to the world as one divinely commissioned? It is exposed here that even such endeavours are egotistical and hence contrary to self-surrender. An illustration dated from the early 20th century, drawn to accompany Yoga Yajnavalkya, an imporant foundational text on yoga from the 12th century CE. Each of these two aims of yoga are there to solve a basic problem. First, as long as you take yourself to be a doer, you suffer. This is corrected with Knowledge as defined above. Note that this Knowledge is not knowledge of something new (additive or positive knowledge) but it is realising something is false (negative knowledge). And second, as long as you are a slave to compulsive desires, right action (ethical and intelligent action in accordance with natural law or dharma) will not fully manifest, and the flow of the innate natural intelligence will be impeded and distorted by these addictive and compulsive tendencies (vasanas). This is corrected by becoming sattvic (peaceful). There are many forms of yoga and some can be very technical and detailed. However in general, some yogas work upon the body, others on the breath/voice, and some focus more on the mind. However the main purpose of yoga is to affect the mind, as this is where the core problems described above lie. Those yogas that work primarily upon the body, voice or breath do so in order to directly or indirectly effect the mind to which they are connected. Each type of yoga strives to achieve the two points mentioned above in a slightly different way. Often there is a conceptual framework within which the yoga operates. When the aim of the yoga has been achieved (ie. by achieving the two points above), then the conceptual framework within which the yoga operated can be dismantled and left behind. Let’s give a simple example of how concepts, even when false, can aid us. If you want to improve your posture an expert may recommend you imagine a length of string attached to the crown of your head, pulling the top of your head upwards towards the sky/ceiling. When you imagine this, you naturally straighten your posture in line with the visualised imaginary piece of string. After practicing this for sometime, your posture improved and now you no longer have to imagine a piece of string. At no point did you actually thinks there was a piece of string actually there, but you can see how this concept was useful to correct your posture. Lets take a look at some of the main traditional forms of yoga to see how this works. In the sections below there are many aspects of the yoga I have not gone into, as the purpose of this text is to demonstrate how yoga can use concepts to achieve the two goals mentioned above, and then the concepts can be thrown away, to be picked up again only when this needs to be taught to someone else. Jnana means knowledge in Sanskrit, and Jnana Yoga is the Yoga of Knowledge. In this yoga the concept of Brahman is introduced and is initially equated as being being-consciousness-bliss (sat-chit-ananda). Brahman is initially defined as being our basic sense of presence-awareness and the teachings show this to be (apparently) Unchanging, Ever-Present/Permanent, Eternal, Infinite and Indestructible. This is stark contrast to the subtle and gross objects that appear within it which are ever-changing, temporary, transient, limited and subject to creation and destruction. The Jnana yogi is taught to identify him/herself as that Unchanging Absolute Brahman and not to identify as the ephemeral objects. Through this process of de-identification with the body-mind and identification with that which does not change, insight into experience occurs. We start to realise that the body-mind entity that we formerly took ourself to be actually is not us at all. We thought that we we responsible for our thoughts and action, whereas from the point of view of Brahman or Absolute Consciousness, it is seen that there is no doer and the body-mind-entity functions by itself. At this point the doer-entity is seen to be non-existant, and Knowledge as defined above in objective (1) arises. At this point the essential job of jnana yoga has been completed, and the concepts of Brahman as being an unchanging essence can then be dropped and life goes on, living itself. There is no attachment to concepts such as the relative and absolute or concepts of the infinite, all of which are ultimately unverifiable in our experience. Incidentally, once the doer has seen to be non-existent, sattva tends to arise over time as the processes that fuel compulsive desires are slowly wiped away, and so objective (2) is also indirectly achieved. We can see that in Jnana yoga the concept of an Absolute Brahman has been useful to us to serve a purpose. However ultimately we cannot know for sure from our experience alone that there is such as thing as the Absolute Unchanging Brahman. Because Knowledge, ie. seeing through the doer, has occurred, Freedom is innately realised, and concepts are not clung to, and no beliefs are required. Karma means action in Sanskrit, and Karma Yoga is the Yoga of Action. There are a few ways karma yoga can be performed according to the traditional scriptures, but one of them is to set up the concept of a personal God, an all-powerful entity that is responsible for everything and every action in the universe. The Karma yogi is taught to realise that it is this God that ultimately has control and not the limited body-mind that it thinks itself to be. The karma yogi therefore practices gladly accepting everything that comes his or her way as a gift from God, working to the best of their ability, but not being attached to the results of their actions. As the Karma yogi starts to learn to be happy regardless of what is happening, this has the direct result of eroding away compulsive desires, converting them into non-compulsive desires, and so eventually objective (2) is achieved. Thereafter, over time, the sense of identification with the body-mind entity loosens and is seen through. It can become apparent to the Karma yogi that actions happen by themselves: thoughts happen by themselves, but there is no thinker, just a spontaneous thought occurring, one by one, in quick succession. Similarly actions happen by themselves: limbs move, lips speak in the same way that dogs bark, leaves rustle and clouds float by – all happens spontaneously, and there is no doer. Here Knowledge arises. Now the yoga has completed its aims: Freedom has been realised and we are seen to be free from suffering – we are seen to have always been free from suffering and the world. Now we no longer have to worry about concept of an infinite all-powerful personal God that is ultimately unknowable and unverifiable. Again, the concept of the infinite God, as with the concept of the Unchanging Indestructible Brahman for Jnana yoga, can be seen to have been a useful tool, aiding the seeker to attain Liberation, but now no longer needs to be believed in. So here are just two examples of how concepts are utilised in yoga to achieve a greater end than perhaps could have been achieved without them. Remember, don’t cling to concepts, beliefs and ideas. Use them by all means, but when you no longer need them, let them go. Ultimately, stay with what you know, stay with what’s true, question your beliefs, be unafraid to admit if you’re wrong, and don’t pretend to know something you don’t. Keeping to these guidelines will safeguard you from dogma, and the suffering that results from it. Can you know something is infinite? Feel free to substitute ‘Dear Universe’ in place of ‘My Lord’. The word yoga can be used to describe a series of specific methods which aid and direct the seeker towards the goal of the ending of suffering or of attaining realisation. So let me start by saying something quite obvious: all of the yogas* are practices to be performed or actions to be done. They are therefore meant to be performed by a person who thinks themselves to be a separate doer-entity. The very existence of the (illusory) separate doer implies a duality – in fact the imagined doer is the essence of duality, the first conceptual step from which all other dualistic notions proceed from. The duality that it sets up is between that of the subject (the doer) and objects (the objects of the world in which actions are done). The aim of all yogas is, through practice, to facilitate a seeing/realisation that the separate doer-entity is an illusion. And therein lies the apparent paradox. Yoga is action undertaken by the (imaginary) separate doer in order to see through this illusion of doership. *Traditionally there are several key yogas outlined in the vedic texts, the main ones being Jnana Yoga (yoga of knowledge or understanding), Karma Yoga (yoga of action), Bhakti Yoga (yoga of devotion) and Raja Yoga (the king of yogas).